Author’s Note: The following player data was pulled via FanGraphs on or about July 17th, 2016. 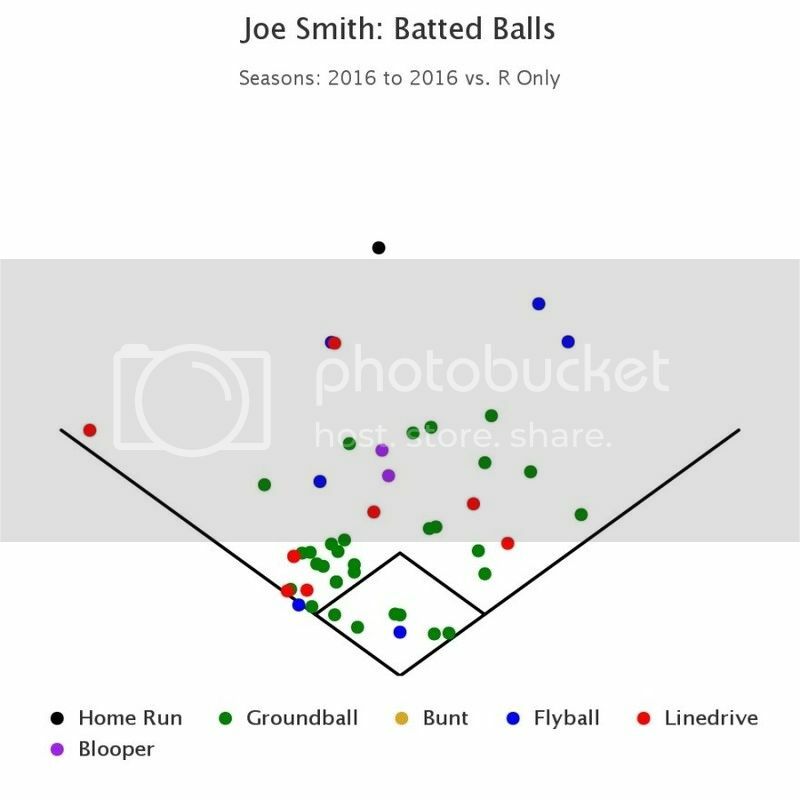 The one consistent theme for the 2016 Angels has been the disabled list and Joe Smith has been no exception to it. Luckily for the Angels he has recovered and returned to the bullpen. Over five relief appearances from July 1st to July 9th Smith has generated a 9.64 K/9 and 3.86 K/9 ratio with a really unlucky and abnormal .588 BABIP and a really good 61.1% GB%. Clearly Joe’s BABIP issues have contributed to his poor performance especially in light of the high number of groundballs that he puts in play. However it’s not just bad luck that has contributed to Smith’s issues. Left-handed hitters have been striking out significantly less in 2016 and have been making better contact resulting in an elevated Batting Average Against (BAA). Additionally, against right-handed hitters, Smith has experienced a significantly elevated walk rate while also seeing more balls falling in to the field of play for hits. Of course there are other “near fit” defensive teams such as the Orioles, Giants, Dodgers, Yankees, Nationals, Mariners, and Astros that could be dark horse candidates for Smith’s services. Heck even the Mets have rumored interest per Mike Puma of the New York post as seen in Chuck’s post on the website. Let us run through the best fit teams and see if any of them have a need for a right-handed setup man. A familiar team in the Trade Candidate series, the Rangers to make a long explanation short could use an additional right-handed reliever. Sam Dyson is effective against right-handed hitters and puts the ball on the ground against both sides of the plate. Keona Kela, Matt Bush, and Jake Diekman have proven effective against both sides of the plate as well. Cesar Ramos was just DFA’d and former Angels Michael Roth has not performed particularly well. If the Rangers went crazy they might try to make a play for Aroldis Chapman or another closer but the bullpen isn’t as big of a problem as the rotation for them right now. It seems more likely the Rangers will make a modest move regarding their bullpen. 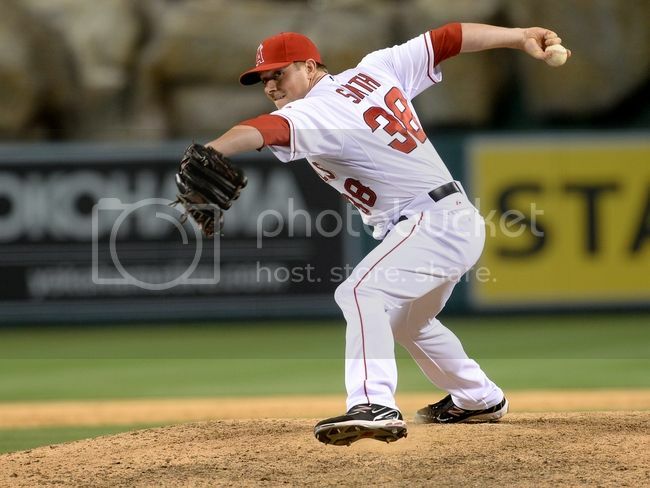 Because Smith is only under team control for the remainder of this year the Angels aren’t concerned about facing him in 2017 and beyond making Texas a potential suitor particularly since Joe puts a lot of balls on the ground which is desirable in Arlington. As we discussed previously in the Huston Street article Theo Epstein and the Cubs were on the lookout for relief help but that need has lessened with the recent acquisition of Mike Montgomery from the Mariners and, at the time of the submission of this article, Aroldis Chapman. When you examine the Cubs bullpen you begin to understand it is an area of weakness that needs to be rectified. Chicago has gotten by with the relievers they have primarily because their starting rotation has been so good and has eaten up so many innings in the first half of the season. If this current bullpen ever gets really tested it could fail. Now that Montgomery is in the fold, he and Rondon provide a stable duo but they could really use either 1) another right-handed setup man, 2) a left-handed elite closer type, or 3) both if they are feeling frisky. If the Chapman talks breakdown it would not surprise the author to see the Cubs pick up a righty like Smith as he brings a different look, via the sidearm delivery, to their relief corps. Additionally they might go for Will Smith of the Brewers as their left-handed solution as well if Chapman doesn’t materialize. Unsurprisingly the Indians have popped up again primarily because they are a great defensive team so a lot of pitchers will fit well into their club. Smith of course used to pitch for the Tribe so a reunion isn’t completely out of the question as team management is very familiar with the player and his personality and demeanor. The Indians actually could use additional right-handed relief as many of their bullpen pitchers are more effective against left-handed hitters and Smith gives a unique look to hitters by changing their eye level in their at-bats. It wouldn’t be a total surprise if the Indians tried to acquire an elite closer type but it probably isn’t as important to them as acquiring another hitter or two. If they do go the hitter route adding a less expensive middle reliever/setup guy makes sense for Cleveland. One of our favorite trade suitors in the Trade Candidate series, Kansas City could certainly use some right-handed middle relief in their current bullpen configuration. 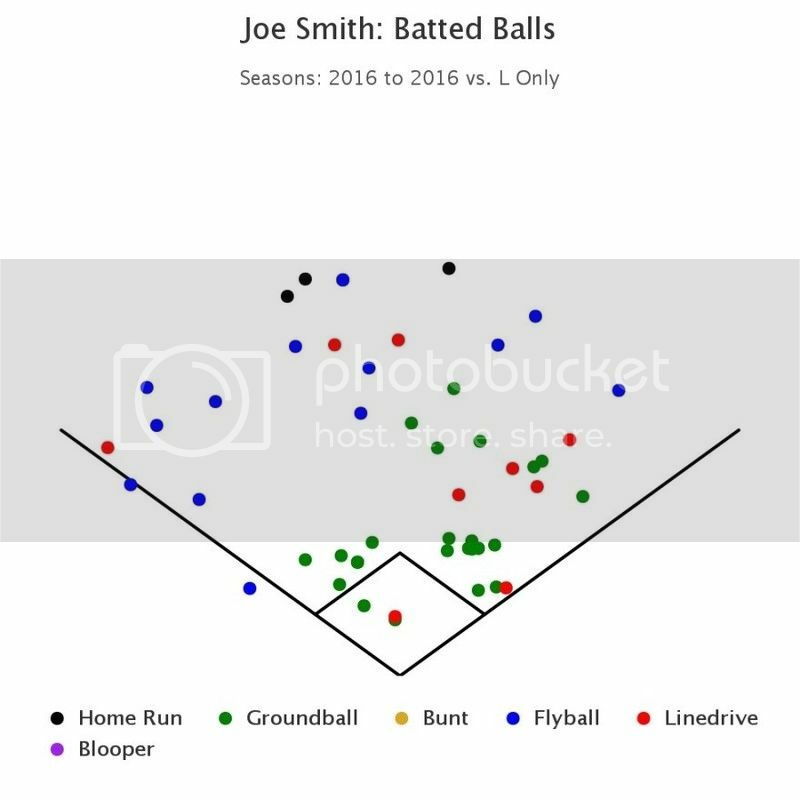 The back-end of the Royals bullpen is strong with Wade Davis, Kelvin Herrera, and Luke Hochevar but they could certainly use someone like Smith against right-handed hitters particularly with Joe’s penchant to keep the ball on the ground. A new name in the Trade Candidate series the Toronto Blue Jays are in the thick of the Division and Wild Card race heading into the trade deadline. The Jays have survived most of the year, so far, on a premier offensive performance featuring Josh Donaldson, Edwin Encarnacion, and Jose Bautista among others. However their starting pitching and bullpen have left a lot to be desired. Stroman and Dickey, despite eating innings, have underperformed. If the playoffs were to start today the Blue Jays would have to roll out Aaron Sanchez and Marco Estrada as their 1-2 and probably J.A. Happ as their third starter so Toronto’s management has to be somewhat concerned. As far as the bullpen goes the clear closer is Roberto Osuna but behind him there really are no other relievers that you can feel fully confident in handing the ball too in a high leverage situation. Drew Storen has performed well against right-handed hitters as have Grillit, Chaves, and Cecil. Biangi, Schultz, and Morales have performed adequately against lefties so the bullpen does have matchup potential. However the bullpen depth is the issue here as any playoff team would like to have at the minimum 2-3 guys who can step into the role especially in those critical late innings. What does any of this have to do with the Blue Jays potential interest in Joe Smith? Despite the fact Toronto has four guys to get right-handed hitters out they might still have interest in Smith because of his sidearm release point and his ability to put the ball on the ground just under 60% of the time especially in their homerun prone stadium. None that make sense, at this point in time, involving Joe Smith. The Marlins, another new team to the Trade Series, have managed to scrape together a good first half with a combination of good offense, decent rotation performance, and a solid bullpen. However as they hurdle towards the trade deadline they face some serious rotation questions behind ace Jose Fernandez. Wei-Yen Chen very recently strained his elbow and could be out for an indefinite period and back-end starters like Tom Koehler and Jose Urena have underperformed. The Marlins could use a good number two starter and a left-handed rotation candidate for their stretch run. Beyond that the bullpen looks really solid with Ramos, Rodney, Barraclough and Wittgren providing quality relief innings. The one thing they could use in the bullpen is a left-handed middle reliever. In the end, as far as Joe Smith is concerned, the Marlins really don’t have a need for him making a trade very unlikely unless their situation changes. Since the ‘2016 Trade Candidate: Hector Santiago’ publication things have changed for the Red Sox. First of all they have acquired LHP Drew Pomeranz making them a bit less likely to acquire another left-handed starter although they could still use one. They have been rumored to be in the mix for White Sox starter Chris Sale but the author does think that Hector Santiago is still a viable option as a back-end starter. Additionally their closer Craig Kimbrel and their set up man Koji Uehara have fallen to injury. Kimbrel could be out until mid-to-late August and Uehara has a rather unique pectoral injury with an unknown timetable for return. All that being said the current configuration of the Red Sox bullpen could use a left-handed middle reliever only making Joe Smith an unlikely acquisition and need for Boston. As you can see being a “best-fit” defensive team doesn’t necessarily mean the team is a good fit based on their roster. Out of the teams listed above the most likely ones to have the greatest interest in Joe Smith would be the Indians and the Royals. The Rangers and Cubs could be secondary choices. The remaining teams don’t really have a pressing need for a right-handed reliever although trades could make an opening available. Of course, as stated above, there could be a dark horse team desperate to pick up additional relief help. No matter what Joe Smith is very unlikely to change the course of the Angels season so trading him is a priority for Billy Eppler. Unless there is absolutely zero demand Joe will be wearing a different uniform soon.